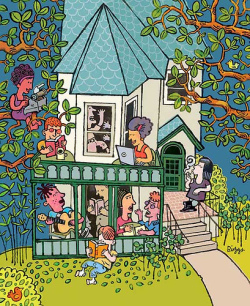 Kelly Writers House has good news for all you artists and dreamers: creativity is the economic fuel of the future. The University of Pennsylvania's meeting place for writers and thinkers recently started a new lecture series titled "Creative Ventures", which highlights the value of creativity and its potential to spark innovation. On November 5th, Alex Mulcahy, GRID's founder and Red Flag Media's owner, spoke on the panel for "Creative Economies," one of the most recent lectures in the series, to show how unconventional thinking influenced his success in the publishing world and can have postive results for others as well. Check out this video of the entire discussion, including thoughts from other out-of-the-box thinkers from Philadelphia, and get creating!